2010 Parks of the Year! Each year four parks, representing each geographical region in Vermont, are presented with the Park of the Year Award. The purpose of the program is to acknowledge exemplary accomplishments of the parks field staff, as well as for the enhancement of public service – to make the parks a better, more enjoyable place to recreate. Competition is fierce and award recipients receive the right to display the coveted "Park of the Year" banner the following season. This year's winners are Molly Stark, Lake Shaftsbury, Grand Isle, and Seyon Lodge (staff for each park shown below in order listed from left to right). Congrats to all for your fantastic work! (Click on pic to enlarge). Southern Vermont and the Lake Champlain area are peaking with prime foliage. Check out the five best parks for leaf peeping this week and see what events and attractions are going on in and around each one. The cooler weather is moving Vermont's incredible fall foliage a little farther south. Below are parks where foliage is at its prime. Also check out the activities in and around the State Parks too. No one is hibernating yet! Periodically, Vermont State Parks must adjust its fees to keep up with inflationary pressures. Fees collected for park services are an important source of revenue to support operation and maintenance of the parks. We try to keep fees affordable and competitive. Most fee changes must be approved via the Administrative Procedures Act (APA) Rule Making Process. An important part of the APA process is to inform the public in advance and give everyone an opportunity to comment. In that spirit, below are the proposed 2010 changes to, "Rules & Regulations - Visitor Conduct & Fees and Charges for State Park Services and Commercial Activities on Department Lands". Stone Hut - increase nightly fee from $150/per night to $195/per night. Kingsland Bay - increase banquet hall fees from $1,000 + $2/per person + $100 trash fee to $2,500 all inclusive. As the cooler weather stretches into the valleys and further south in Vermont, the beautiful fall foliage spreads with it. Below are six state parks where the foliage and things to do are in full swing. Pick up great locally grown food at the Old Fashioned Harvest Market; Do a wine tasting at Boyden Valley Winery; Listen to a lecture by artists Chris Brown or Pablo Helquera at the Vermont Studio Center in Johnson, VT; Hike Mt. Mansfield, VT's highest peak: take a gondola ride up the mountain or drive up Mt. Mansfield's Auto Road; Stroll through the Grist Mill Covered Bridge in Jeffersonville, VT; Celebrate Shelburne's 32nd annual Harvest Festival; Pick up some historic facts from the Jericho's Snowflake Bentley Museum ("Snowflake" Bentley was the first person to photograph a single snow crystal!). Hike Mt. Manfield, VT's highest peak; Take a gondola ride up the mountain; Drive up Mt. Mansfield's Auto Road; Bike Ride on the Stowe Bike Path; Check out British Invasion Car Show Weekend; Visit the Boyden Valley Winery; Visit Cold Hollow Cider Mill; Take a tour of the Ben & Jerry's Ice Cream Factory. 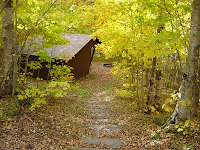 Try a stay in a cozy cabin; Bring your own boat, and paddle on Island Pond, or rent one and paddle on Spectacle Pond, Check out the Northeast Kingdom's Foliage Festival; participate in North Woods Stewardship Center's Foliage Bike Ride; Hike at Lake Willoughby; Paddle the Clyde River; Visit the Silvio Conte NWR. Haunted Hike Happening at Little River State Park! Come join us for a special event! Saturday, October 2, at 10:00 AM in Little River State Park, Waterbury, VT, author Tim Simard and Little River State Park Interpreter, Brian Aust, will host a spooky presentation and hike. Participants will trek through the autumn woods to discover remnants of the old Goodell Farmhouse on the Dalley Loop Trail and hear about the spooky mysteries of locals’ past. Attendees should park at the History Hike Parking Lot (Dalley Loop/Hedgehog Hill Loop Trails). Children of all ages and well-behaved and leashed pets are welcome. Feel free to bring snacks or lunch and water. This program will go on, rain or shine. Park entrance fee is required to attend. 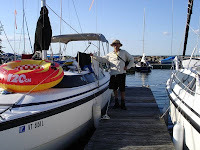 Haven't had your fill of swimming and picnicking yet for this year? 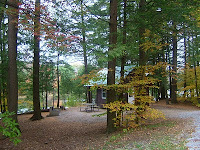 Well, Camp Plymouth State Park will be open on weekends throughout the month of September. A popular place for day use and weddings, the park will open at noon on Fridays and at 10:00 AM on Saturdays and Sundays. The concession stand will be open from noon - 5:00 PM for ice cream, refreshments and boat rental. Pavilion rentals will also be available on weekends. Sorry, but pets are not permitted at this park. 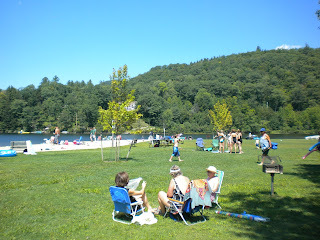 Camp Plymouth is also known for its housekeeping cottages, group and horse camping areas, popular playground, wide expanses of well-manicured lawns and its proximity to Coolidge State Park, with its spectacular fall hiking, the Calvin Coolidge Presidential Historic Site, Okemo, Killington and Pico resorts. Burton Island's Marina Season Is Extended! So, we're trying an experiment...Burton Island's Marina will continue to be open through the 1st and 2nd week after Labor Day! Come enjoy the beautiful waters and great fishing of Lake Champlain, as well as one of the best places for swimming and picnicking. 15 boat moorings and a 100-slip marina with Wi-Fi connection, dockside electricity, fuel service, and a marine holding-tank pumpout facility plus 3 miles of shoreline, hiking trails make Burton Island a very unique state park. For those wanting to visit after Labor Day, the bath house will be open, wood will be available, and the inner marina will have electricity.